Monday Morning Digest: Education should go online…. yes or no? Home / Blog / Monday Morning Digest: Education should go online…. yes or no? This week’s digest is chock-full of articles covering a wide array of education-related topics and submitted to me by a number of our staff members. What I find most interesting is the juxtaposition of two articles – one stating why we shouldn’t be putting education online because it widens the gap between the financially/educationally-privileged and everyone else, and another which predicts a complete switch-over to digital education because of, among other things, the benefits that it provides. The objective of most online learning outfits – particularly those that provide free education – is to level the playing field of education and make knowledge more accessible to all. However, critics claim that online education will, in fact, increase the gap between well-to-do students and those facing barriers to education by building another obstacle: access to broadband Internet. This article explores reasons why this gap would increase – not close – due to online education offerings. To MOOC or not to MOOC? In this interview with the Chronicle of Higher Education, George Siemens, who leads Athabasca University’s Technology Enhanced Knowledge Research Institute, makes the case for why colleges should experiment with inviting tens of thousands of students to participate in their free and online courses. While this post doesn’t deal with online education, I wanted to share it because it raises some interesting (and in my mind, questionable) points about completion rates of education. It draws a parallel between the low graduation/ sucess rates in school and the difficulties that students face with Algebra. Wondering when higher education will completely shift to a digital offering? 36 months, according to this article in Inside Higher Ed. He states that factors such as evolving technology, student attitudes towards digital education, and the ease of collaboration provided by online platforms can work together to solve one of the greatest challenges of our time: improving student performance. 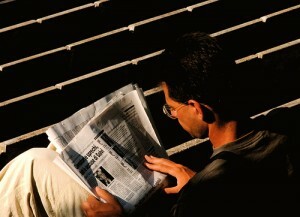 The image “Reading the newspaper” came from Flickr user pedrosimoes7 and is licensed under a Creative Commons CC BY license. I would like to see Hedges debate that opinion with the shoeshiner in Nairobi or carpenter in Sao Paulo who saves every penny to buy education for himself and his family. It seems rather self-serving too, since Hedges became a “bourgeois bohemian” polemicist after his careers as a Christian theologian and a mainstream reporter both ended in failure.